Unrest In Ferguson May Speed Up Decline Of Real Estate Many in the Missouri city are worried about its future, and there's speculation there will be a "mass migration" should violence erupt again. But some residents remain committed to the city. 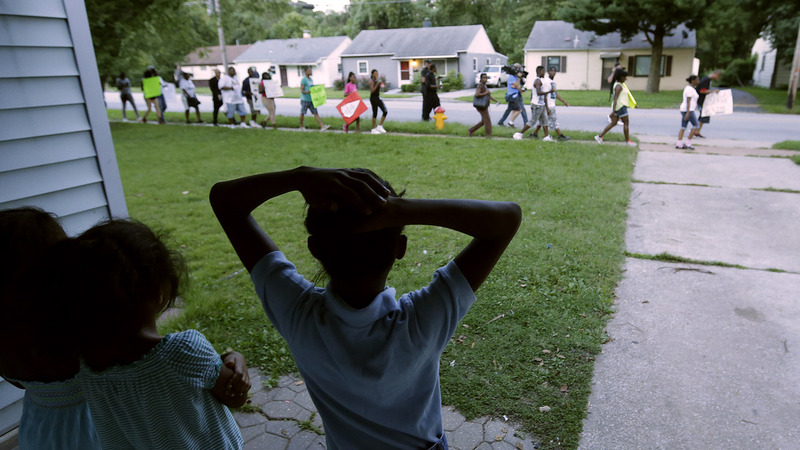 Children watch from their home in Ferguson, Mo., on Aug. 20 as people march about a mile to the police station to protest the shooting of Michael Brown. Brown's shooting in the middle of a street by a Ferguson police officer on Aug. 9 sparked protests, riots and looting in the St. Louis suburb. Some people are ready to leave the troubled city. Others say they will remain no matter what. A grand jury has yet to decide whether it will indict Darren Wilson, the police officer who fatally shot 18-year-old Michael Brown in Ferguson, Mo., this summer. Protests over Brown's death are ongoing in Ferguson, though they are calmer than the sometimes violent clashes that happened immediately after the shooting. Still, many residents there are worried about public reaction once the grand jury announces its decision, and some say they've had enough. They're planning to move. That could accelerate an already existing trend in the region. If you're taking the highway, Ferguson sits about 20 minutes northwest of downtown St. Louis, putting it in the inner ring of the northern suburbs. A couple of generations ago, this is where the wealthier residents moved in search of better schools and bigger houses. Most lots here have single-family houses built just after World War II, with tall trees and sidewalks. Pearce Neikirk grew up here, and has watched the suburb of 20,000 shift from mostly white residents to about two-thirds black residents. He says houses here in Ferguson are more affordable than houses in suburbs farther away from the city. But more affluent residents continue to move west. "As their incomes increased, they decided, well, hey, I can buy something new, I can buy something bigger, I can buy something with land around it," Neikirk says. "And so then they of course do leave." Neikirk, who's a real estate agent here, says in the initial weeks of the protests, his phone didn't ring at all. Neikirk allowed some of his clients to withdraw their homes from the market. Some buyers were concerned that the properties they were looking at would lose value. Realtors have sold fewer than half as many homes over the past 30 days compared with the same time last year, but it's a slow time of year for real estate anyway. "It's just one of these things where no matter how we sort the MLS data or no matter how we look at the tax rolls, there's not a picture being painted yet," he says. "Now, I think that is going to be painted in the next four or five months." But resident Afrika Bryant isn't waiting that long: "Yeah, I want to get out of here. You know?" Bryant lives a block away from the burned-out Quik Trip gas station that became the epicenter of many of the first protests in Ferguson. She's a nurse and mother of four who recently remarried. A few days after the Michael Brown shooting, about a dozen of her friends and family members gathered in her backyard to celebrate her wedding. But when police cracked down on protesters in the street nearby, tear gas hurled toward her sun porch. "I can literally show you three cans of the tear gas. They were shooting rubber bullets," Bryant says. "My neighbor, she's like 70 years old, she's in her backyard looking at what's going on — they shot her." Bryant is now making plans to move when her lease is up in the spring. But will there be a mass migration from Ferguson? A lot of Bryant's neighbors have lived here for decades and say they won't leave under any circumstances. University of Iowa history professor Colin Gordon studies urban sprawl in the St. Louis region, and he expects the protests to accelerate the pattern of suburbanization that was already well underway. "What shaped the state of the city a generation ago — people reacting to the size of houses, the declining quality of schools — that's now happening to the inner suburbs like Ferguson," he says. Gordon says discriminatory housing practices and zoning laws in and around St. Louis kept most black residents from moving out of the city until the '70s and '80s. When wealthier black families began to move into suburbs such as Ferguson, some white families moved farther west. Now, Gordon says, it's more economic migration than it is white flight. When the wealthier families move out, house prices drop and communities become affordable. But with those lower property values come other issues. "It's a sort of vicious cycle, because schools rely on local funding. If the schools deteriorate because the local funding is falling off, what's the response? People leave," Gordon says. But homeowner Brian Owens isn't leaving. As we walk through a neighborhood near an elementary school, where he might send his kids someday, Owens says there's an opportunity here for Ferguson, to possibly come together and address the problems that have plagued so many other cities. "We have a responsibility to stay. A lot of those changes are hard changes and are going to take a lot of work and a long time," Owens says. "But, that's OK. Because nothing worth having ever comes easy, or ever comes quickly."